UPDATE: This product was once recalled but the brand has new owners with some interesting new products. Since the early 90’s I have always carried some form of water purification when travelling. This stems from nearly dying of Amoebic Dysentery in India. Not long after that adventure I found myself responsible for 18 travellers and myself as I would tour around Lake Victoria in Africa. The route would take us from Kenya, through Tanzania, Uganda and Zaire. The prolific waterborne parasites and diseases where a constant reminder of how dangerous contaminated water can be. Needless to say, I got comfortably paranoid about ensuring myself and those around me had decent drinking water. Especially as contaminated water kills millions of people yearly. Many don’t even have access to drinking water. Let alone the means to safely purify it. I remember in India some travel guides used to warn against drinking bottled water as it was so easy to ‘fake’ so I’d carry purifying tablets, iodine drops and a ceramic filter. It was hard to calculate dosage with tablets,iodine tasted disgusting and I have found that ceramic filters easily broke. If only things were as simple as what I’ve now found from Lifesaver Systems. Once unboxed it was a simple matter of priming the filter it and it was ready to go. It’s a little bulkier than my normal water bottle but this is a water container and filtration system all in one. And no ordinary filtration system at that. The nanotechnology it incorporates ensures that the holes in the membrane are too small to let bacteria or even viruses through. 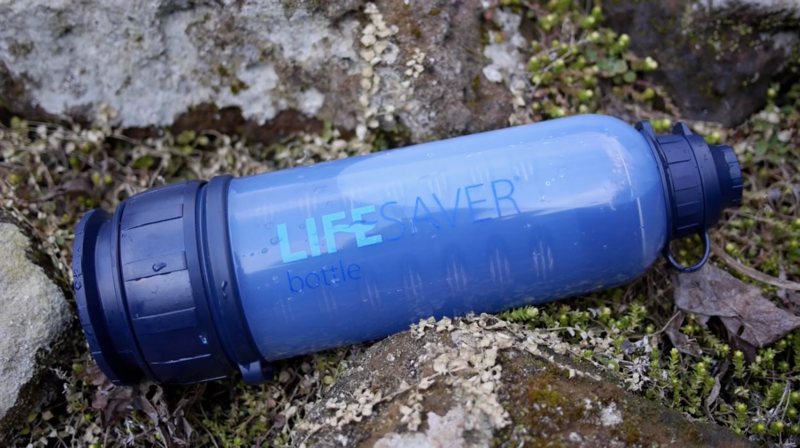 This same bottle can be found being used across a broad spectrum of people from the military, humanitarian organisations and like myself, bushcrafters and lovers of the outdoors. Lifesaver Systems invent, design and manufacture their products in Great Britain and are winning awards all over the place. After my short time with the 6000UF I can see why. Be warned though. Don’t pump it up loads of times when empty and then take off the bottom. It’s a pressurised container and the bottom will fly off if unscrewed. You should not have to worry about this if unlike me you have some common sense. Apparently you get an idea when the filter needs changing as it gets harder and harder to pump the water through. A rinse of the filter may get you a little more usage but it’s good to know you are not going to find it just stops working when you really need it. It might be you do not venture far from the city but don’t like the tap water. Stop buying bottled water for all the reasons you know to be right and get a simple bottle you can carry daily. Personally.. I like to be ready for all eventualities. [Disclosure] I received this unit for use in an imminent overseas project where I plan to pass it on to those that need this system in order to survive.. I have not entered into any kind of financial arrangement with Lifesaver Systems and these opinions are my own. This was on BBC 2 tonight (17/04/13) on Tomorrow’s World: A Horizon Special. Definitely worth a watch if you can find it on iPlayer. The inventor, Michael Pritchard, breaks down and explains the process and then field tests the unit making presenter Liz Bonnin drink the water that he had previously added sewage and doggy ‘gifts’ to. Lifesaver had to recall this product but they are now under new ownership and I hear all the issues connected to the past owners are now sorted.